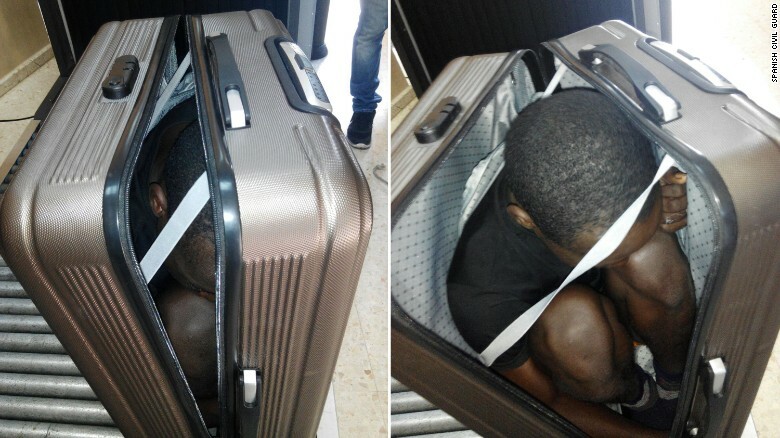 (P1) A young woman has been caught trying to smuggle a teenage African migrant hidden in her suitcase into Spanish territory. (P2) Authorities stopped the 22-year old woman last week at a border crossing into Ceuta, one of two Spanish enclaves in North Africa, from neighboring Morocco. (P3) A 19-year old migrant from Gabon was found concealed inside. The man was immediately offered medical attention due to the lack of oxygen inside the compact travel bag, Spain’s Civil Guard said in a statement. (P4) Border control had become suspicious of the woman after they noticed she was carrying her luggage on top of a trolley, authorities added. (P5) Spanish officials said the woman showed an “evasive attitude while going through the established controls and nervousness” while speaking to agents. (P6) Ceuta along with the province of Melilla to the east, are Europe’s only land borders in Africa. Both enclaves have long been popular transit points for hundreds of sub-Saharan African migrants trying to cross the sea at the narrow point south of Spain. (P7) This creative but dangerous method of concealment is one of several desperate approaches to illegal smuggling that the Spanish Civil Guard has faced in the past week on the Ceuta border. (P8) Two migrants, a man and a woman from Guinea, were also rescued Monday after authorities discovered them hidden inside the dashboard and the backseat of a car, according to the Spanish Civil Guard. (P9) The migrants were 20 and 24 years old, according to officials. The Moroccan man driving the vehicle, a Volkswagen, Golf, was arrested. The car had been stolen in Barcelona in 2015 and had fake Moroccan plates and registration documents, the statement added. (P10) Meanwhile, at least 800 African migrants tried to storm a border fence into Ceuta from Morocco on New Year’s Day, according to the Spanish and Moroccan governments, Reuters reported. (P11) Most of the migrants were prevented from entering Spanish territory. A handful of migrants scaled the six-meter high barbed wire fence, but were eventually helped down by cranes, Reuters reported. Dozens of Moroccan security forces were injured in the incident, along with five Spanish police officers. In your opinion, why do you think people go to extreme measures to migrate to another country illegally? Describe what you think it would be like concealed in a suitcase. Do you think it would be worth risking your life to be smuggled into another country? Why or why not? The authorities at the border, where the woman was trying to cross, notice irregular behavior from the woman because of the suitcases on the ____________. A male and female from __________ were saved from a _____________ car. They were hidden in the ____________ and ______________. What’s the name of the city where 800 or maybe more people tried physically enter from Morocco? How many security guards were injured in the attempt to illegally cross over into Ceuta?